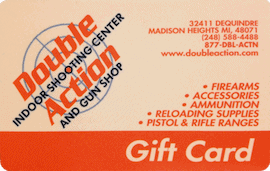 At Double Action You Don’t Pay Extra. It’s Included! Any caliber LESS than .50AE is allowed on the pistol range. Rifle Range fees include handgun calibers of .50AE or higher, INCLUDING Thompson Center Firearms, will now be charged the $24.00 Rifle Range Rate.